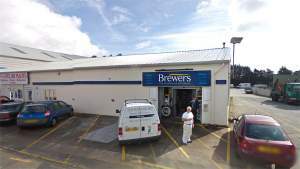 Ours is the only dedicated decorators’ merchant in St Austell, with a small, close-knit team of staff trained to offer advice and help for both trade and retail enquiries. You’ll find a comprehensive range of paints for all purposes, with thousands of colours available; extensive wallpaper choices; and various useful painting and decorating equipment. We’re on St Austell Bay Business Park – where there is plenty of free parking and other stores providing everything for the modern builder, developer and DIY enthusiast. The business park is on Par Moor Road, off the A390 between Holmbush and St Blazey. We also offer a free delivery service throughout Cornwall. Follow Par Moor Road Westbound until reaching a turning on the left into the St. Austell Bay Business Park. Follow Par Moor Road Southbound until reaching a turning on the right into the St. Austell Bay Business Park.